Award winning, Celebrity Makeup & Henna Artist founded an internationally recognised Beauty Brand based on the pillars to educate, empower and create opportunities for others. Through careful orchestration and attention to detail, he has built this brand through discipline, dedication and determination and delivers luxury, elegance, style and sophistication. Like a true artist at heart, Ash Kumar wanted to inspire, educate, empower and create opportunities for others. As a result, this led him to start his very own Training Academy in the UK, Canada and the USA. Ash Kumar is the first South Asian Beauty Brand to break barriers into the western beauty world, becoming a cutting edge leader in henna, hair and makeup. Encompassing Training Academies across Europe and North America, a Professional Line of Henna Products and World Renowned Bridal Services. It has been Ash Kumar’s delivery of excellence that has made a coveted name in Asian beauty globally. Ash Kumar was born and raised in London yet his inspiration has come from his travels across the globe and architecture, modern arts to culture. A student of life - his ethos is to inspire, share, celebrate and learn more about the world. Ash Kumar's international portfolio spans from working with Corporate Organizations, Hollywood, Bollywood & Musical Stars. Over the last decade he has had the opportunity to work with; Virgin Media, Swarovski, Thorntons, XFactor UK, Aveda, Estée Lauder, Emirates, Cadenzza, Shah Rukh Khan, Aishwariya Rai, Julia Roberts, Madonna as well as many others. Most recently Ash is creating work for non-beauty related companies, he is now sought after for his artistry, design & creative direction. Ash Kumar exceeded beyond arts of beauty as he challenged the traditional view of henna with new perspectives and brought it into the modern design world, creating a design lifestyle through his masterpieces. This has now became several projects and collaborations from global brands. His next chapter -Ash Kumar The Artist : www.ashkumarartist.com. Executive Artist and Henna Educator for the Ash Kumar Academy Canada - Dr Shafeena Premji has two deep passions and purposes in life - mendhi and medicine. She is a practicing physician in Obstetrics and Women's Health but also an extraordinary and skilled mendhi artist. She began her henna journey at the age of 17 when she became inspired by the artistic design and history of henna and how it makes a woman feel sensual and beautiful. The process of becoming a professional artist happened without her even realizing it. She recalls "studying" the astounding work of Ash Kumar and trying to deconstruct his design process in her own mind. Shafeena is Ash Kumars #1 fan! When she finally met him years after admiring his work, it was a dream-come-true. And when he personally asked her to join the Academy during her 2nd day in her henna course, she knew being an educator was meant for her Shafeena believes that God has blessed her with the natural skill as a henna artist, and feels that through the AK Academy, she can now inspire and help her students dreams come true. Shafeena LOVES bridal mendhi. That's where she is inspired the most. There is gratification in spending quiet special moments with her client as she transforms her into a beautiful bride in preparation for the most important day in her life. Every bridal design is unique, each having its own focal point, and customized to suit the client. As an Executive Artist and Henna Educator for the Ash Kumar Academy, Shafeena thoroughly enjoys the classroom time with her students. She brings a very beautiful spiritual component to the classroom where she is inspirational, motivating, warm and approachable - all these which comes very naturally to her. In her eyes, every student represents one more opportunity to change a life, uplift a soul, and to inspire someone towards their deeper passion for art in their life. Sarina began her exciting journey with the AK brand in 2012. 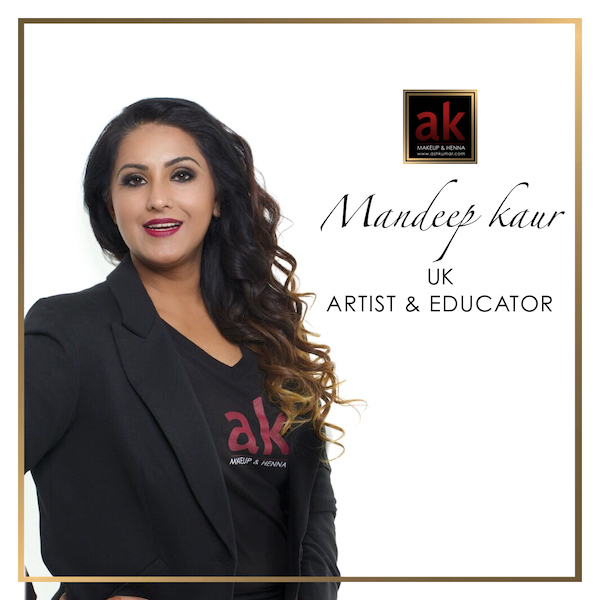 Her passion for Makeup bought her to the AK Studios in London’s where she went on to complete the AK Hair Makeup & Henna Course, and then showcased her skills in a professional portfolio shoot which was later featured in a Magazine. Since then Sarina has been part of incredible experiences at AK. This includes being part of the talented Makeup & Styling Team for high end client bookings as well as numerous international bookings. 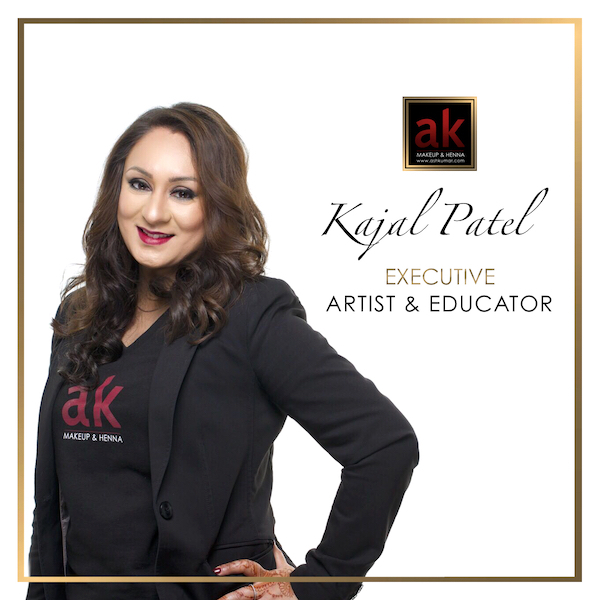 Her creativity, energy and warming personality caught Mr Kumar's eye which opened an amazing door of opportunity for her to become part of the Elite Management Team at AK heading the AK Artist Agency. 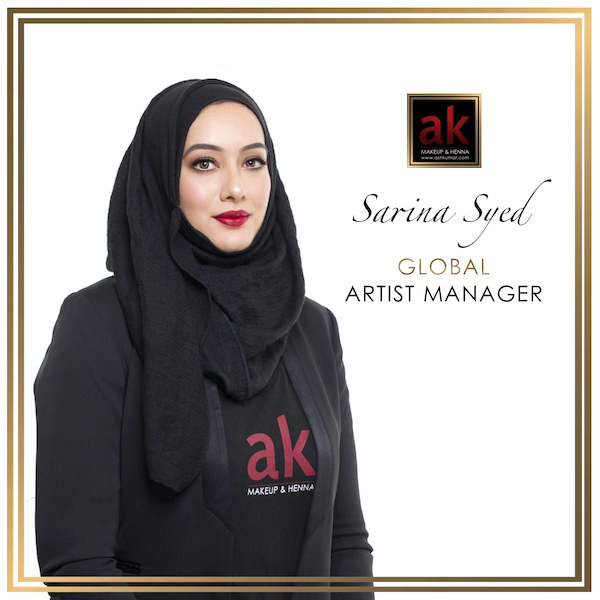 As The Artist Manager for the global team (AK International Makeup and Henna Artists) Sarina is responsible for a worldwide client base, delivering the highest standards expected by the Brand to all her clients from intimate family events, high profile corporate events to lavish celebrity weddings. Sarina is living the dream of being a part of the most prestigious brand and experiencing history in the making . She endeavours to always bring her fresh positive energy to ensure that every bride has the ultimate AK experience. She believes that if you keep faith in your passion and natural abilities then your passion and natural abilities will always speak for itself. From an early age, Jasmin’s creative flair and interest in art became apparent to others around her. She was always fascinated with the art of henna and loved having it applied on her hands. She never thought that she would be the one applying this beautiful art form on others. Jasmin began her journey with the AK Brand in 2012. It was her passion for henna that led her straight to the doors of the Ash Kumar Academy. She then she has gone on to showcase her skills on a professional portfolio shoots. 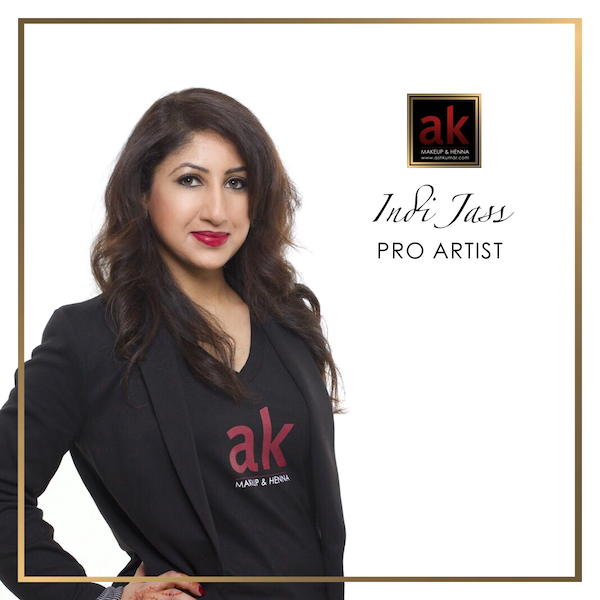 Jasmin feels fortunate to be part of the Ash Kumar Artist Agency and loves all the experiences such as being part of a talented team on high profile henna bookings and international bookings. She has gained valuable experience, which has helped her develop as an artist. The love and dedication that Jasmin has for the art has seen her grow and succeed as an artist. She always strives to make a bride look and feel beautiful on her big day. Her clients have always valued her patience, outgoing and friendly personality. Jasmin is proof that you should take every opportunity that comes your way, you never know what it could lead to. Sharmin Kassam officially started her journey with the Ash Kumar Brand when she completed the Toronto Henna Class in 2014. As a Civil Engineering Technologist working in the construction industry, she never anticipated taking her passion for henna to a professional level; it was the kind words of her friends and family that helped her officially take the plunge. 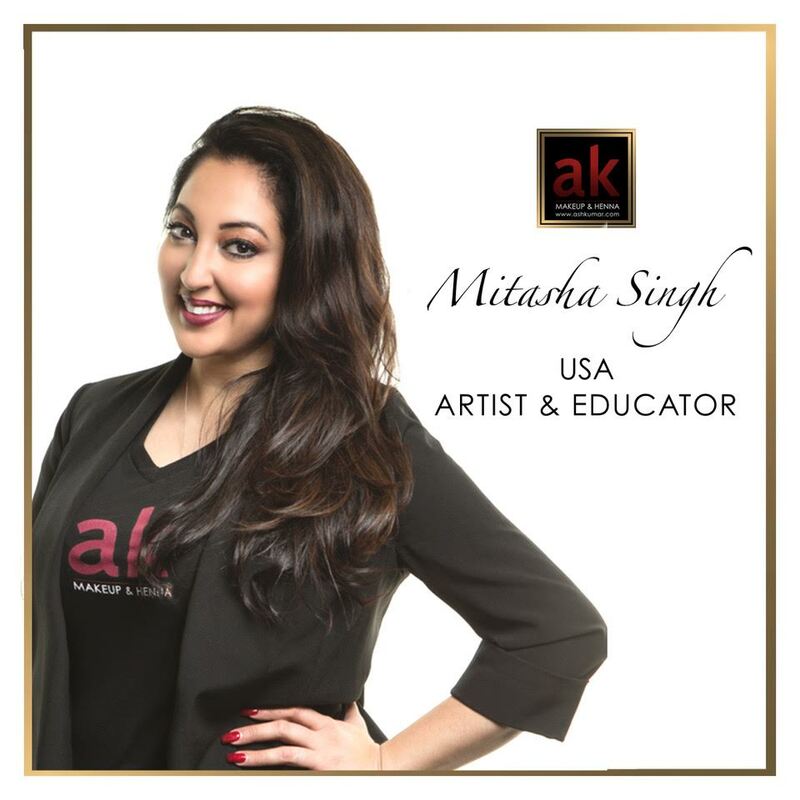 Falling in love with the quality and integrity behind the AK Group of Companies, she persevered through school, and her full-time work while consistently staying connected to the Ash Kumar Community. 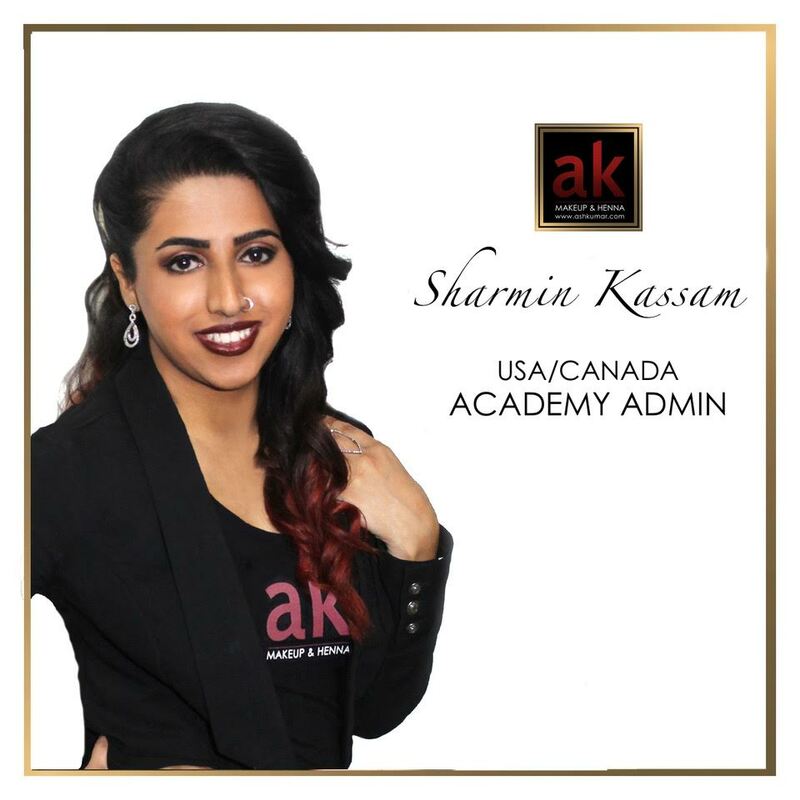 Sharmin’s passion, organization and driven nature brought her to the point of becoming the official Product Stockist for Canada in 2016, and in 2018 started her new role as USA/ Canada Academy Admin reporting to Soo Ladha. As someone who strongly believes in the motto, “practice, patience, perseverance”, she feels that every person dedicated to honing their craft can only get better by being mindful of these three elements. 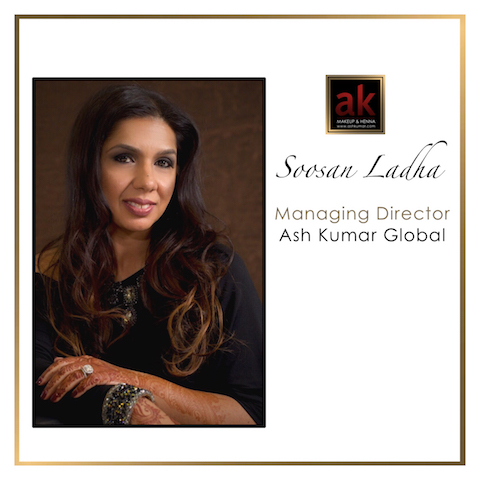 It is only a constant implementation of this motto she says, that has brought her the opportunity to represent the Ash Kumar Brand. Lavanya’s journey started with Ash Kumar in 2016 where she wanted to pursue her passion in Henna, Hair & Makeup. She is from a Computer Science background but has always had an artistic flair and interest in beauty & design which she believes is her inner passion. Upon designing jewellery it is then Lavanya discovered how diverse and unique you can be as an artist. This is where her love for Henna began as she was amazed by intricacy & parallels of henna art. 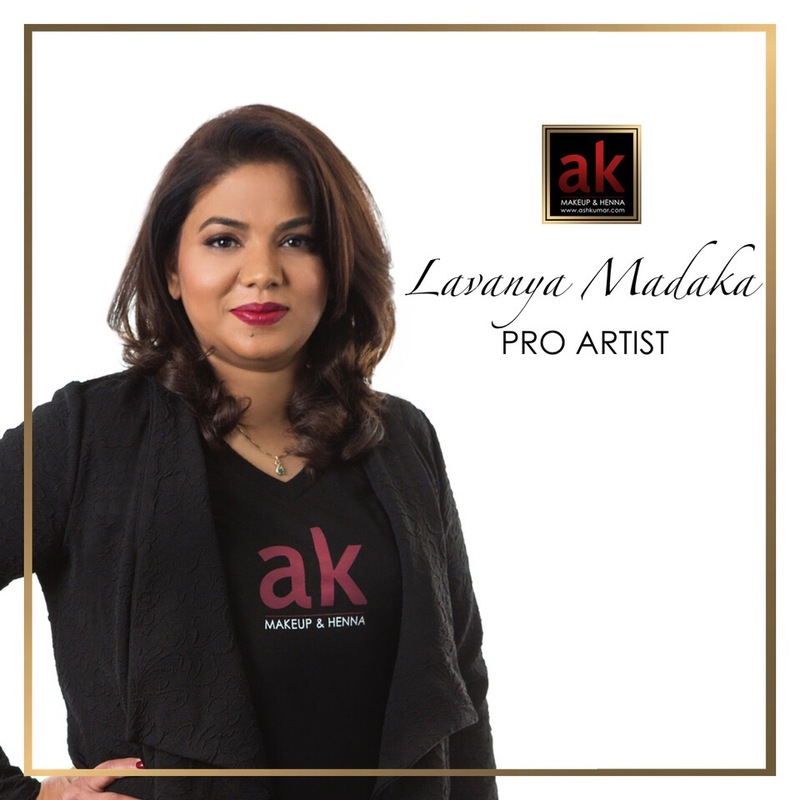 After completing all the Ash Kumar professional courses this opened up new horizons to creativity and Lavanya gained more confidence as an artist. She took every opportunity that came her way to create beautiful breathtaking bridal makeup & henna shoots. Her attention to detail, eye for jewellery and her love of using colour is reflected in each look she has created thus far. Although Lavanya enjoys all areas of makeup she feels working with Brides and Bridal Makeup is the most exciting! She believes each bride should feel special and receive a unique and individual look personalised to them. Blending traditional with modern to achieve that truly unique result. Her friendly and relaxed approach towards her brides ensures that not only the bride but the entire bridal party is rest assured that the special day will be a memorable one! The opportunity to become part of the Ash Kumar Team was a dream come true and a wonderful chance for Lavanya to mature as an artist and bring many more smiles to women during those special occasions in their life. Lavanya believes that every woman is blessed with natural beautiful.. Highlighting and bringing the enhanced natural beauty to the forefront is always her focus.